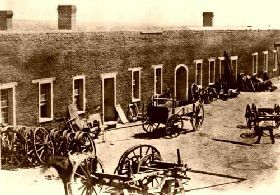 A bustling center of frontier defense in the Southwest for four decades, Fort Union was the largest U.S. military post in the region and a base for both military and civilian ventures that molded its destiny. Astride the southern end of the Mountain Branch of the Santa Fe Trail near the point where it merged with the southern terminus of the Cimarron Cutoff, the post was one of the most important of a string established in New Mexico and southern Arizona in the area acquired from Mexico in the Mexican War (1846-48). The fort’s mission was broad. It protected the Santa Fe Trail, on which it was a resting place and refitting point and a stopping point for Independence, Missouri–Santa Fe mail coaches; was the major Army supply depot in the Southwest; served as a transportation center for civilian wagon freighters carrying military supplies; and provided a base for campaigns that penetrated the homeland of the Apache, Ute, Navajo, Kiowa, and Comanche. Also, in a phase of history extraneous to this volume, the fort played a strong role in repelling the Confederate invasion of New Mexico from Texas in 1862; it was the prime staging area and logistical base and supported the force of Colorado Volunteers that won a victory over the southerners at the Battle of Glorieta Pass, New Mexico in March 1862. Three different Fort Unions existed over the years. The first, a shabby collection of log buildings, was erected in 1851, only five years after the U.S. conquest of New Mexico, on the west bank of Coyote Creek. The second post, begun in 1861 in preparation for the Confederate thrust from the south, was located across the creek from the first. A massive earthwork fort in a star shape, it had ditches, parapets, and bombproofs. Work continued intermittently until June 1862, by which time the need for the fortification had passed. The last fort, a large complex of adobe structures in the Territorial architectural style, was begun in 1863 and finished in 1869. It was situated in the same area as the star fort, except for the arsenal, built on the site of the first fort. Probably the most dramatic duty of the garrison, particularly at the time of Indian uprisings, was furnishing escorts and other protection for the Santa Fe Trail. Dragoons and Mounted Riflemen focused their efforts on the Cimarron Cutoff, which extended northeastward to the Cimarron Crossing of the Arkansas River. Travel over it was risky, for it passed through Kiowa and Comanche country, but it had the advantage of being shorter than the Mountain Branch. The Civil War years were the most critical time on the trail because of the Confederate threat of invasion and attacks on trail caravans, the critical need to assure a continuous flow of provisions to Union forces in New Mexico, and the mounting Indian menace occasioned partly by the withdrawal of Regular troops and their replacement by Volunteers. Nevertheless the fort—employing escorts, temporary posts, and full-scale offensive campaigns—kept the trail open. The trail was related to the fort’s mission as a supply depot. Over it, until the Santa Fe Railway arrived in the region in 1879, surged long tandem freight wagons, pulled by 12-yoke teams, carrying military supplies to the fort for distribution to posts all over the Southwest. The heavy concentration of troops in New Mexico and Arizona were scattered at far-flung posts. The land was not rich enough to feed this army, and almost all provisions had to be hauled over the Santa Fe Trail from Fort Leavenworth, Kansas. The need for a depot in eastern New Mexico to receive and distribute supplies and ordnance was clear. The wagon freighting traffic grew so heavy that Fort Union became a freight destination rivaling if not exceeding Santa Fe in importance. Civilian companies performed under contract virtually all military freighting on the trail. The freight was unloaded at Fort Union, repacked, and assigned as needed to other posts. When wagons or entire trains contained shipments for one fort only, they often continued directly to their destination. Large-scale military freighting, dominated by Russell, Majors, and Waddell, continued until 1866 when the railroad moved west into Kansas. Each railhead town thereafter served briefly as the port of embarkation for freight wagons. After the rails reached Denver in 1870, wagons continued to move supplies over the Mountain Branch of the trail between Pueblo and Fort Union. The Santa Fe Railway crossed the Mora Valley in 1879 and ended the era of military freighting on the trail. 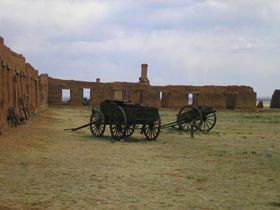 Protection of the Santa Fe Trail and logistical support of troops in the region were indirectly related to the Indian wars, but the fort was also directly involved in them. When the U.S. acquired the Southwest in the Mexican War, it also inherited the Indian problems that had plagued its people since the earliest times. The nomadic tribes of New Mexico had long fought the Spaniards and Mexicans. Now they fought the Americans, who were overrunning their lands, killing off their game, or passing over transcontinental trails on their way to the California goldfields. From 1851 until 1875, in major offensives or patrol-type actions, sometimes meeting the enemy and sometimes not, Fort Union troops were usually in the field, skirmishing with Indians. Notable campaigns in which the garrison took part before the Civil War were those against the Jicarilla Apache, in 1854; the Utes, in 1855, in southern Colorado, then part of New Mexico Territory; and in 1860 the Kiowa and Comanche menacing the eastern borders of New Mexico. The Indians were especially troublesome during the Civil War, when General James H. Carleton, head of the California Column of Volunteers, directed Army operations in New Mexico. The tribes seized the opportunity offered by the Confederate attack on New Mexico to step up their raiding. New Mexico and California Volunteers under Colonel Kit Carson, an experienced Indian fighter, conducted three major campaigns: against the Mescalero Apache (1862-63), Navajo (1863-64), and Kiowa and Comanche (1864-65). Fort Union Regulars, who replaced the Volunteers after the Civil War, along with troops from other New Mexico posts, took part in the final wars against the southern Plains tribes: General Sheridan’s 1868-69 campaign, and the Red River War of 1874-75. These campaigns ended the fort’s participation in the Indian wars. In 1879 the arrival of the Santa Fe Railway largely ended its usefulness as a supply depot, but it was not abandoned until 1891. 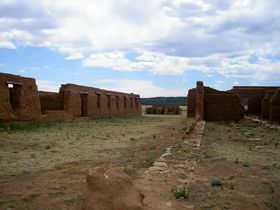 Rising sharply and starkly from the plains, the history-shrouded adobe ruins of Fort Union, stabilized to arrest erosion, are reminders of a vanished frontier. 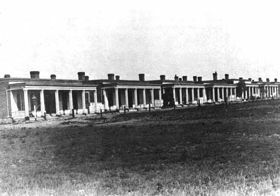 Sprawling north nearly half a mile from the visitor center are a few chimneys and the outlines of melted walls of corrals, stables, hospital, barracks, officers’ quarters, and large warehouses that made up Fort Union in the years 1863-91. Adjacent to this post was the massive star fort (1861-62). Ruins of the arsenal from the 1863-91 complex lie across the valley to the west, on the same site as the original log fort (1851-62), most traces of which have long since disappeared. Exceptional trail ruts of the Santa Fe Trail are readily identifiable in the vicinity and may be followed for miles. A museum and a visitor center interpret the history of the fort, and a self-guiding tour leads through the remains. 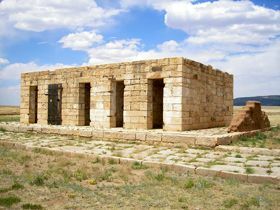 Fort Union is located about 8 miles north of Watrous, New Mexico on NM Highway161. Compiled and edited by Kathy Weiser/Legends of America, updated December 2018.